Pressure Gauges | Blue Ribbon Pressure Gauges - Chase Controls, Inc.
Chase Controls is a stocking distributor for Blue Ribbon Corporation. 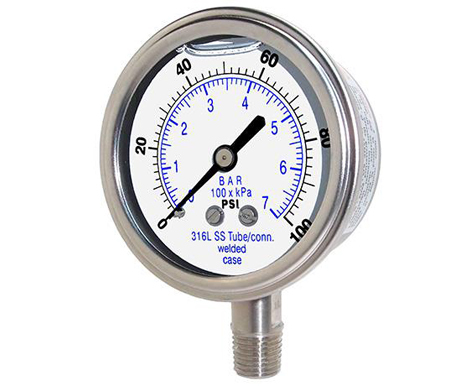 Blue Ribbon manufactures a complete line of pressure gauges ranging in size from 1 ½ to 4 ½ dials in all pressure ranges. Case materials are black steel, stainless steel, or phenolic. Models are offered as either dry or liquid filled. The movement is the heart of the pressure gauge; its function is to accurately position the pointer in response to movement of the bourdon tube. Blue Ribbon movements are designed for smooth movement, low friction, and minimal play.